We believe our core strength lies in listening to our clients. Each group has an idea of what they want. Each group is also very different in terms of who they are, how many they are, where they are located. Using this information allows Zest to design each event for each client. No cookie cutter here. We like people to think of us as Creative, Innovative, and Flexible. Fun, interactive, team events! Simple and straight forward we create awesome group experiences for our clients. Indoors or out, half or full-day, on the beach, in the mountains or a city to develop the perfect scape, Zest has done it all. How about a fun team cooking challenge, a charitable go-kart or bike build or an Amazing Chase? Have your own ideas? Perfect! Let’s work together to build the perfect event using our expertise and industry connections. You name the place, we’ve probably been there. Across North America and beyond, Zest Adventures delivers its events where our clients are located. Indoors or out. From meeting rooms to parks and really cool resorts, Zest can design an event to accommodate group size timing and setting. Yes, we travel! In Canada, Zest operates in many cities, Ottawa, Toronto, Calgary and Vancouver just to name a few. In 2018 Zest Adventures celebrates its 11th anniversary but that is just the recent part of the story. Zest got its running start from the parent company, the Delta Synergy, a renowned corporate training organization who in 2018 celebrate its own 26th anniversary serving a wide variety of clientele. 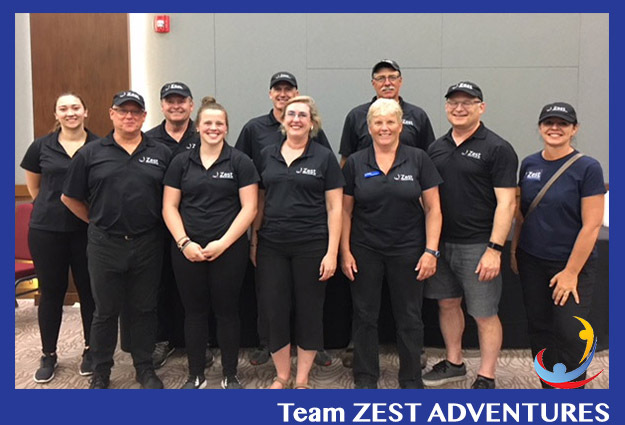 Zest is comprised of diversely talented individuals who continually bring their unique abilities into play when designing and delivering innovative, enjoyable and interactive team building events for our clients.